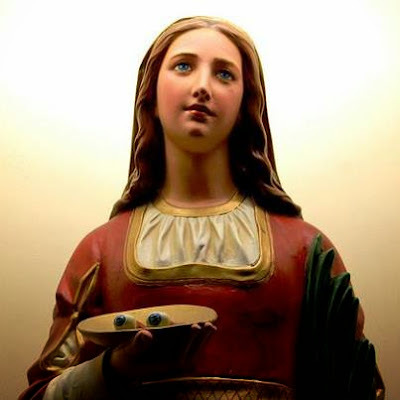 (Saint Lucy): “My beloved brethren, I, Lucia, come again today to bless ye and give ye Peace. I love ye, I love ye very much and want your salvation. I do not want you to suffer on the day of the Warning, therefore I say unto ye: Convert yeselves without delay, that on that day in which the Heavens and Earth will shake themselves before the fulminant blow from the Arm of God. Ye be not exterminated by the pain that the vision of the worldwide, familial and individual sins will cause to each one of ye. I wish that your conversion truly turns your soul, on that day, whiter than snow. Therefore, pray, atone for the sins of your past life, doing penance and prayer and seeking all you can to offer a sacrifice to God, in atonement for your own sins and those of the whole world. Verily, I repeat to ye what Our Blessed and Glorious Brother, Saint Anthony, has already said to ye: Where your hearts are, there are your eyes. If your eyes are in impurity, it is because your hearts are already full of it. If your ayes are in greed, it is because your hearts are already there. If your eyes are on a particular creature, or a particular thing, it is because in this creature or in this thing, your hearts are already enslaved. One such soul could never be a great saint, nor could receive the Holy Spirit, the Love in pure transformation. To receive the Supernatural Love, it is necessary to be unfastened and with the heart free of all these things. Seek, therefore, heavenly things, seek to put your hearts in God and in His Love, so that then, He may pour upon ye His Holy Spirit will all plenitude, transforming ye into new Saint Anthonys for the conversion and salvation of this world. ‘Sursum corda’ Lift up your hearts! May your heart be on God only and seeking only the salvation of your neighbor, with a perfect love in God, in pure transformation. Then, truly, God's Grace will be poured into your souls and your souls will grow like lush lilies in the Garden of Holiness. To everyone now, I bless generously and I also bless, with the Mother of God, these Statues of Our dear Anthony, which are Here. Where they go will go the abundance of God's Graces, many miracles, liberations and conversions will be operated. And I, Lucy, will be along with Him, accompanying these Statues, bringing many graces from God, with the Angels and causing many hearts to receive a great effusion of the Gifts, of the Goods of the Holy Spirit. To everyone at this time, I bless generously, from Syracuse, from Lisbon and from Jacareí.